All of us at Habibi Halaqas are very excited to present to our readers another exciting and God willing, beneficial initiative in the form of this online and in-print magazine. Habibi Halaqas is now widely popular for providing rich content (especially articles and webinars) on topics from all spheres that touch a Muslim woman's life such as Islam, psychology, parenting, health, grooming, and more! This magazine touches upon these same themes and topics and provides a compilation of articles, book reviews, stories, practical ideas, readers' opinions and more, all revolving around the same theme in one place! 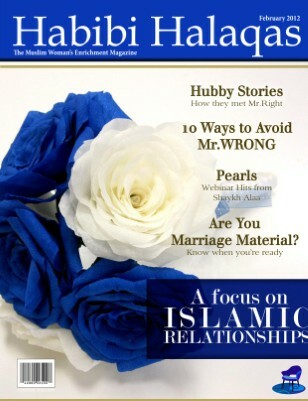 The theme for our first issue is "A Focus on Islamic Relationships". We have tried to gather as much apt information as we can on men-women dynamics, mostly pre-marriage, and concise information on marital relationships. This issue provides a great starting point for women to start thinking about what's to come in their near future. Dont miss out! Get your copy today!!! Habibi Halaqas' first magazine issue focuses on marital relationships and the journey from pre-marriage to marriage of a man and a woman from an Islamic point of view. Issue includes articles such as 10 Ways to Avoid Mr. Wrong, Are You Marriage Material - Knowing When You are Ready?, Marriage Advice By Sisters-For Sisters and MORE! Dont miss out!!! Muslim Women: Movers and Shakers! You set the pace and others follow. Kanika, keep up the good works. MaashaAllaah TabarakaAllaah. I am very Inspired by the manner ALLAH has Blessed HH. If there is a lesson to take from HH's story for me it would be: Have a good intention to begin with and work hard at it. ALLAH will do the rest..Congratulation to ALL the team!Masha ALLAh Tabarakallah! The magazine cover is tempting! Very well-designed! Here's looking at another quality publication for Muslim women! The cover of the magazine is beautiful. Can't wait to read. The issues covered in the magazine look very interesting; I hope to read at least one issue some day! Masha'allah! Another great achievement to add to HH's kitty. May it keep reaching greater heights enshallah ! MashAllah ! 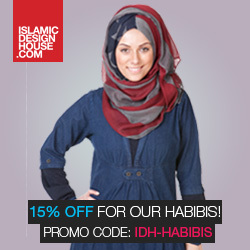 GOOO Habibi Halaqa team !! WOOO HOO ! Alhumulillah, we have such magazines out there. I have been a subscriber to the weekly casts and the topics are always on relevant things. Things that affect our community (Muslim an Non-Muslim) and how it inevitably affects us. These email reminders are refreshing and a great way to start the day on the right foot. Its hard to be able to reach out to people when they have such busy lives or only use the internet for pleasure an not combine it with seeking knowledge. That is why having HH's webinars an emails is a great way to make sure the internet is used to the best of our abilities. Jazakallahukhayr HH for allowing us to still keep in touch with our deen, an with no excuses! spread information for all us who seek guidance in our Faith of Islam. p.s. Is there an address to mail order from? I haven't the means to pay online. Masha'a Allah Tabarak Allah! Have benefited in being a good human, a better muslima from this blog, may Allah reward everyone involved, and keep us all on Sirat-Al-Mustaqeem, ameen. Assalamalaykum!! You're the winner of our MAGAZINE GIVEAWAY!! Please send me your email address so I can forward you a copy! Jazzak Allah khair!! !